Korra and Asami as a canon romantic couple is CONFIRMED. The completely obvious is categorically and unequivocally confirmed; Korrasami is canon on every level. 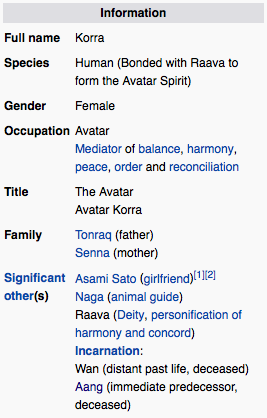 The Korra page on Wikipedia – where I had been fighting the erasure battle – has been unlocked, and the edit has already been made. I’d won the argument to at least the point of being in Significant Other with a section talking about the evidence – now we can just skip ahead because 100% creator-confirmed yes that is exactly what we meant and you gotta deal with it. I am dealing with it by crying my remaining good eye out. I had no idea how much this mattered to me. It mattered to me because of how much I couldn’t let myself believe it was possible, no matter how heavily they were hinting at it all the last couple of series. I just couldn’t let myself buy in, I wanted to, but I couldn’t believe it was possible I was just praying we’d get an ambiguous no-endgame ending, and I was prepared to respect that. I feel like a huge, missing piece of my emotional childhood has just been filled in. I feel like something very old and very hurt just got healed. I never believed we would actually get this one. I have never been happier to be so wrong. KORRASAMI IS CANON AND YOU GOTTA DEAL WITH IT! And, at least today, everything is beautiful and nothing – not even Wikipedia – hurts. 8 comments on Livejournal; 2 comments on Google+. @solarbirdy I’m so glad they posted, and the posts are wonderful. Danielle Ni Dhighe liked this on Facebook. Cameron Larios liked this on Facebook. Paul Johnson liked this on Facebook. Jenny Griffee liked this on Facebook. Bubo G. Gear liked this on Facebook. Ellen Eades liked this on Facebook.